I had originally heard about the Trylle series after hearing about the Amanda Hocking phenomenon. Her story requires a separate post of it's own because a couple of paragraphs wouldn't do it justice. 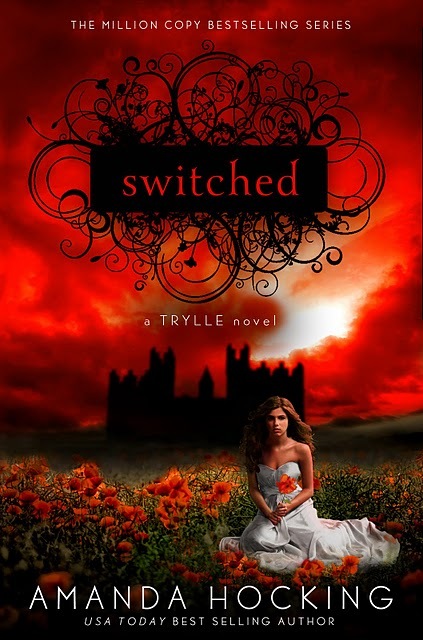 Switched is the first book in the Trylle series and I just finished reading it not even half an hour ago and I must say I loved it, absolutely loved it. I liked the whole concept of the troll people A.K.A. Trylle and the original idea that Amanda had with this story. The book was beautifully written with such vivid imagery and humor I fell in love with the book after only the second chapter. This book also had a few "swoon-worthy" moments regarding a romance that takes place in the book that I couldn't resist smiling to as I read along. The characters were so lively and likable, Amanda did a phenomenal job with characterization and plot. Unlike other reviews I've read I don't agree with what they said about the pace of the novel, saying it was too quick and choppy. However, I beg to differ I honestly think it ran quite smoothly and I wouldn't have wanted it any other way. This was a great book and I completely recommend it without a moment's hesitation, I can't wait to dive into the sequel. I also want to mention how beautiful the cover work is :) I really like the concept of each of the covers playing with the story included in each book. What I really liked about this version of the book is that it came with a bonus short story related to the Trylle series told from the perspective of the Vittra (basically the bad guys in the series). I liked the perspective change and it definitely gave a different angle to look at everything from. Get your hands on this book and get reading because the last book of the series Ascend is coming out this coming Tuesday (April 24th). Here's the book trailer for Switched, the first of the Trylle series for anyone that wants to check it out. YAY glad you enjoyed this one Noellie :) !! I still haven't read it yet but I look forward to now that I've read your review ..Trylle sounds like a great character !! I love the cover as well ! !